After the Mini Blue Max crashed and sat fermenting, Ak had a great idea: just about anything could be mounted to a Slow Stick aluminum rod using various GWS fixtures. 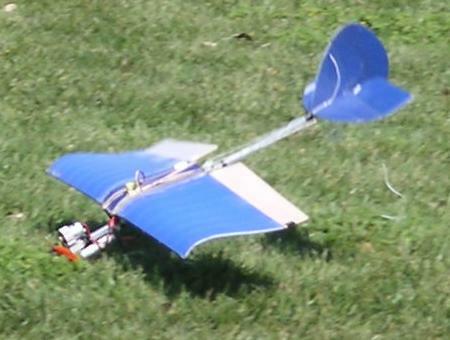 So the tail feathers and wing found their way onto a Slow Stick aluminum pole, and the wings fit the SS mounts perfectly. However, when all was said and done, the plane flew like a wounded duck. I suspected the dihedral (the V shape of the wings as viewed from the front) but am now more suspicious of the negative camber (the 'scooped' airfoil under the wing). So after a crash, I rebuilt it with anhedral on the suggestion of a former military pilot. This actually seemed to fly fairly well, but the opinions were mixed. I thought it was pretty much okay, but Ak thought it was about the same as before. I was destined never to know for sure. 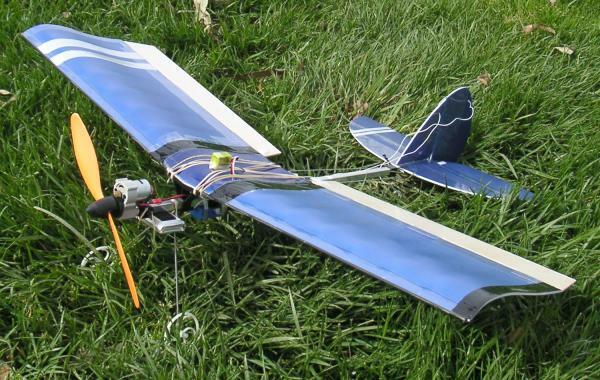 After about two minutes of testing by Ak, on the second flight, a weakness in my wing joints made itself apparent and the plane went down in spectacular fashion. Fortunately the pilot didn't burn.